Summer provides a great opportunity for science camps. TLC has been conducting these camps for many years and they have grown to be quite popular. Having additional time available allows for more hands-on participation and activities that are more focused on particular areas of science and project building. One of the kid's favorite activities involves the building and launching of the Professor's UFO. It all adds up to great fun and an unforgettable learning experience. Scouts, Explorer Groups, Church Youth Groups, Boys and Girls Clubs and others are encouraged to contact TLC well in advance to help plan unique summer camps for their groups. 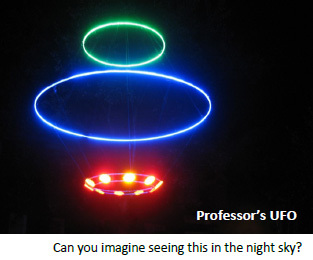 Always looking for ways to get kids interested in science & technology, the Professor created a UFO. The UFO flies over his neighborhood each Halloween. The UFO project has grown from a neighborhood tradition to a great summer science camp project for kids ages 8-18 to build. Parents are also allowed to participate providing they have a permission note from their kids.